This acclaimed documentary tells the powerful, untold story of the 18-year fight to free the West Memphis 3, three teenagers wrongfully convicted of the 1993 murders of three eight-year-old boy in West Memphis, Arkansas. The film was the Official Selection at the 2012 Sundance and Toronto International Film Festivals, and a 2013 nominee for Best Documentary from BAFTA, the Writers Guild of America, the Satellite Awards, the British Film Institute and the Broadcast Film Critics Association. Culver City, CA (6/17/12) - Academy Award(R)-winning producers Peter Jackson and Fran Walsh (both 2003, Best Picture & Best Adapted Screenplay, The Lord of the Rings: The Return of the King) present West of Memphis , available August 6th on Blu-ray(TM) and DVD from Sony Pictures Home Entertainment. Directed by Academy Award(R) nominee Amy Berg (2007, Best Documentary - Feature, Deliver Us From Evil), this acclaimed documentary tells the powerful, untold story of the 18-year fight to free the "West Memphis 3," three teenagers wrongfully convicted of the 1993 murders of three eight-year-old boy in West Memphis, Arkansas. The film was the Official Selection at the 2012 Sundance and Toronto International Film Festivals, and a 2013 nominee for Best Documentary from BAFTA, the Writers Guild of America, the Satellite Awards, the British Film Institute and the Broadcast Film Critics Association. 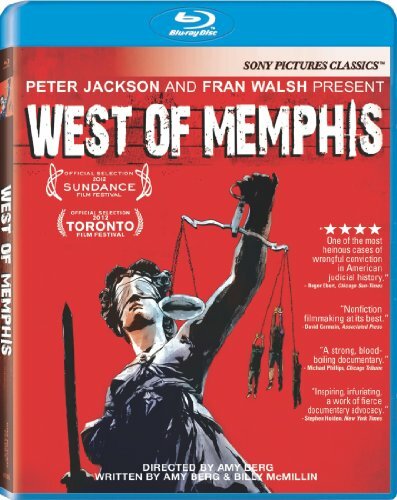 West of Memphis features revealing new interviews from key figures in the case, testimony from experts hired to re-examine the original evidence, and appearances by celebrity advocates Peter Jackson, Johnny Depp, Henry Rollins, Natalie Maines and Eddie Vedder. Exclusive to the Blu-ray is Commentary with Amy Berg, Damien Echols and Lorri Davis, as well as footage from the Toronto International Film Festival (TIFF) Red Carpet, Q&A and press conference. Both the Blu-ray and DVD include deleted scenes and "Damien's Past Re-Creations." Synopsis: From Academy Award(R)-nominated filmmaker Amy Berg (2007, Best Documentary - Feature, Deliver Us From Evil) in collaboration with the multiple Academy Award(R)-winning team of Peter Jackson and Fran Walsh (2003, Best Picture & Best Adapted Screenplay, The Lord of the Rings: The Return of the King), WEST OF MEMPHIS tells the untold story behind an extraordinary and desperate fight to stop the State of Arkansas from killing an innocent man. Told and produced by those who lived it, Damien Echols and Lorri Davis, the film uncovers new evidence surrounding the 1993 murders of three eight-year-old boys in the small town of West Memphis, Arkansas, and exposes the wrongful conviction of three teenagers who lost 18 years of their lives imprisoned for crimes they did not commit. The documentary was written by Amy Berg and Billy McMillin (Project Kashmir, Iraq in Fragments). It was produced by Peter Jackson, Fran Walsh, Amy Berg, Damien Echols and Lorri Davis. Executive Producer is Ken Kamins (The Hobbit, District 9). It has a run time of approximately 147 minutes and is rated R for disturbing violent content and some language. "Academy Award(R)" and "Oscar(R)" are the registered trademarks and service marks of the Academy of Motion Picture Arts and Sciences. Sony Pictures Home Entertainment is a Sony Pictures Entertainment (SPE) company. Sony Pictures Entertainment (SPE) is a subsidiary of Sony Corporation of America, a subsidiary of Tokyo-based Sony Corporation. SPE's global operations encompass motion picture production and distribution; television production and distribution; home entertainment acquisition and distribution; a global channel network; digital content creation and distribution; operation of studio facilities; development of new entertainment products, services and technologies; and distribution of entertainment in more than 159 countries. For additional information, go to http://www.sonypictures.com/.